Lia, the owner of Bayside Florist in Edith Street, feels like a child in a candy shop every single day at work and never gets sick of so many flowers. Over the past six years Lia has met many brides-to-be and is conscious of how flowers are one of the most important elements of a wedding day. If you are a future bride you can arrange a private appointment to discuss your personal needs and requirements to be perfectly tailored for your special day. Looking for something a bit different? Artificial flowers are back and have come a long way with no mess, natural looking blooms to brighten your office, home or next corporate events. The joy of flowers keeps on giving and on the rare occasion that Bayside Florist has to temporarily close Lia gets great pleasure in ensuring that her flowers do not go to waste, distributing them to local businesses in the area. 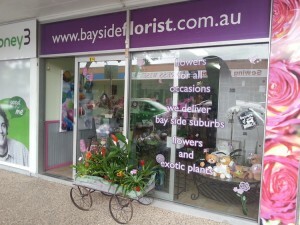 Bayside Florist has a great relationship with many of the local schools including Iona, Guardian Angels and Wynnum State School, supplying flowers for staff member farewells, babies, graduations and even school chapels. And being a Passport Office for The Republic of Wynnum as well, Bayside Florist can provide a floral setting for your new citizenship ceremony!